I was lying in my bed, listening to birdsong, the echo of sounds I’ve heard for more than 30 Junes — Swainson’s thrushes, black-headed grosbeaks, robins, and even loons down on Sakinaw Lake. And I was reading Michael Longley’s Snow Water, specifically the poem “Echoes”, when I heard a loud thump as a bird hit the big window in the living room. I went out in my nightdress with a soft cloth to gather up whatever had collided with the deep reflection of trees in the plate-glass. 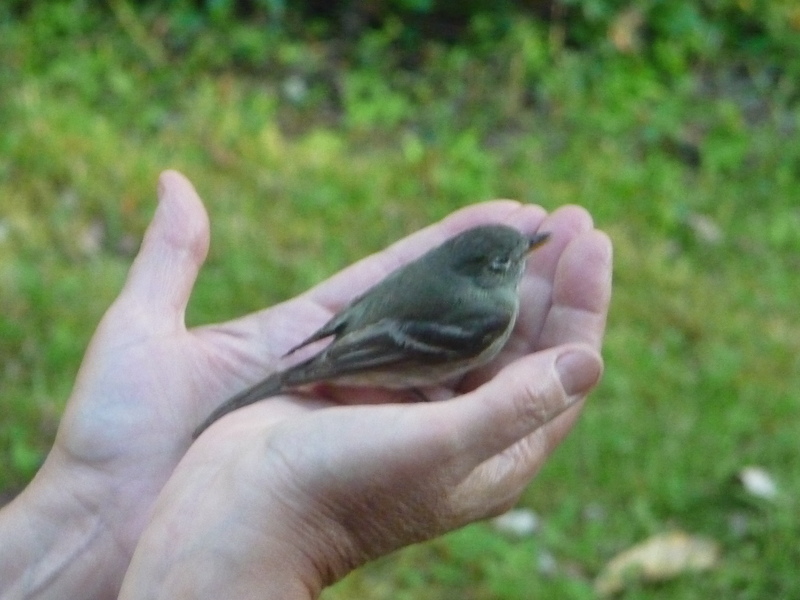 And it was this tiny bird. Suspended, neither feeding nor dying. So now back to Michael Longley and his beautiful poems with all the world in them, the smallest of lives and the losses and the terrible wars and the solace of otters. And while I read them, I’ll remember the first time I heard loons on this piece of land. We’d come up to begin to prepare the site for the house we were planning to build. We knew nothing about building but we had a few tools and John had drawn basic plans and had them blueprinted (as one did then). John put together a plywood platform and we set our tent on that so we’d be at least up off the ground — it was April, a rainy month on the coast. We had a two-week old baby and he slept between us. Awake one night to feed him — that at least was simple! — I heard loons, the long mournful cry they make most often when they’re breeding and nesting. It’s a sound I’ll never forget, just as I’ll never forget the tiny weight of that bird in my hand, the close tangle of my husband and child in the darkness of our tent at the very beginning of what became a family, the echoes we carry in our hearts and remember on June evenings, reading poetry before sleep. ~ by theresakishkan on June 26, 2014. Yes, he’s one of the great ones, I think. His translations are particularly fine. Theresa, I’ll order Michael Longley from the library asap – sorry to say I’ve never heard of him, thank you for the introduction. This is a beautiful, haunting piece of writing. I could hear a loon as I read. Beth, ML’s collection, A Hundred Doors, has the most beautiful suite of poems for his grandchildren. They’re not maudlin but perfectly tuned. This entry was posted on June 26, 2014 at 4:20 am and is filed under Uncategorized.You can follow any responses to this entry through the RSS 2.0 feed.You can leave a response, or trackback from your own site.